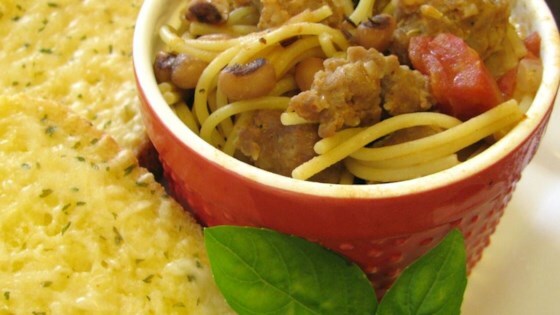 "This easy dish was a big surprise. My husband rated it 9 out of 10 food stars." This was really good! The only thing I changed was adding a small can of tomato sauce to the broth, because I knew my husband wouldn't like the tomato chunks, and then a little bit of pepper. This recipe was pretty good but I know why it calls for low sodium broth. Too salty... Oops. Really delicious with a 6 oz can of tomato paste & mild sausage! I used about half the pasta recommended & the dish turned out really well. This is a really good recipe. I did not give it five stars because that rating should be saved for a knock your socks off dish. It had good flavor and I liked the components of this dish. Very good! I used regular Hot Italian Sausage which spiced it up a bit. Good way to get those New year's Black Eyed Peas.